I mentioned before that we are finally into the home stretch when it comes to painting the interior of our home. It has taken us about 3 years but we just have our bonus room and our master bedroom left. I think its finally time to tackle our room! I still pinch myself when I walk into our beautiful home. I am not sure how it all worked out but we got a steal on this house. Sure it needed a little paint, but it was all cosmetic and we couldn’t be happier with the way it is turning out. We are doing it ourselves so it has taken a little longer than most people, but it is turning into the home of our dreams. For our bedroom, I want something serene and relaxing. 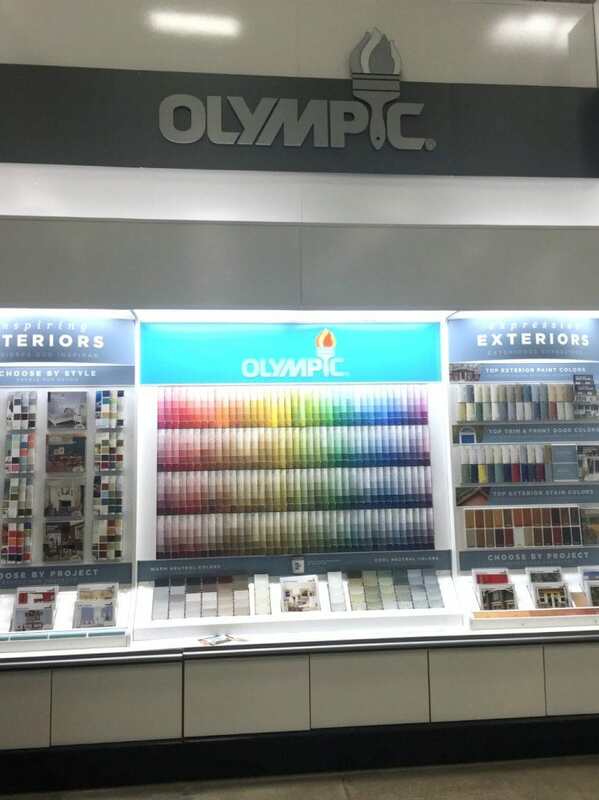 I wasn’t sure exactly what I wanted so I headed to Lowes to check out the Olympic Paints and Stains Color Center for inspiration. Exclusively at Lowe’s, the Olympic Paints and Stains Color Center allows people to browse paints and stains in one place. The colors are organized to make finding and comparing shades easier than ever. From light pastels to dark accent notes, the new Olympic Paints and Stains Color Center has the right shade for everyone. The inspiration is everywhere at the Color Center. Room brochures are arranged to allow shopping in 3 ways: Color (through the chips); Lifestyle (through the lifestyle brochures); and Project (room and project brochures). They have many different ways to combine color palates and showcase projects that it is very easy to get inspired. I was having a hard time choosing between blues and greens. 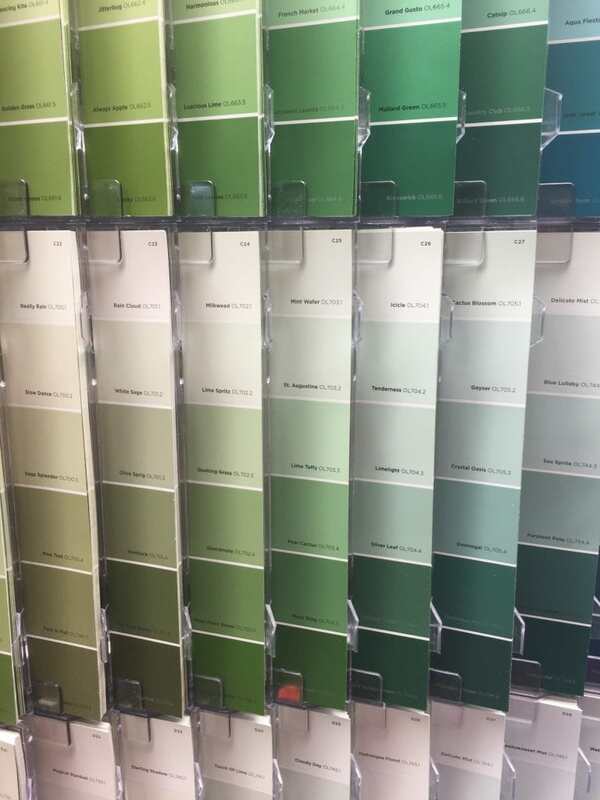 I never had thought about doing a green bedroom until I saw some of the ideas that Olympic had on the back of the color cards. The brochures also helped me to think about adding another color to the room and making my serene bedroom even more beautiful. 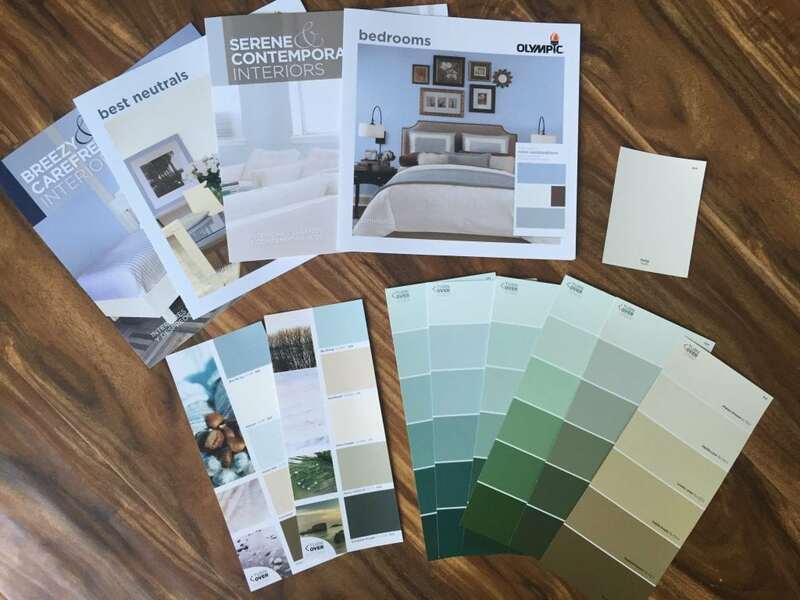 After my visit, I gathered some of the brochures and paint swatches in the living room floor and went over some ideas for our bedroom with my husband. We knew we wanted something light colored, the walls we have now are dark red and a forest green that reminds us a little too much of Christmas. The dark colors make the room feel smaller than it actually is and it doesn’t really make us feel like we live in our dream home. The bedroom brochure inspired me. We have a large bed with sconces on either side, just like the picture on the front. Their picture makes me happy and relaxed while the reality of our room makes me anxious and sad. Operation Serene Bedroom is commencing here in the next couple of months. I took my inspiration and decided to create a mood board to keep me on track and to give my husband a little visual of what I am going for. The aqua colors are a good mix between the blues and the greens. 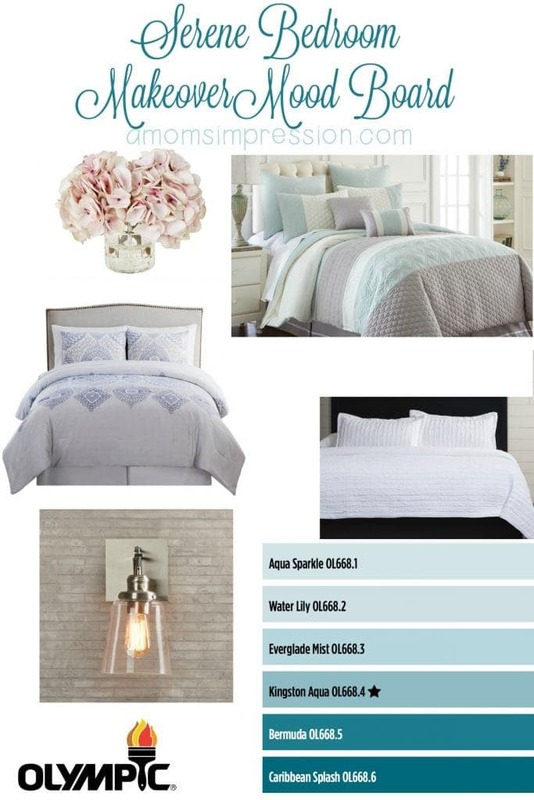 I want to introduce some light greys and maybe even a little pink just to make it feel airy and contemporary. I’m not 100% sure of the wall color yet but this gives us a bit to go on and I am excited to tackle this project. Its about time we get our dream bedroom in our dream house! Be sure to come back in June to see the big reveal! 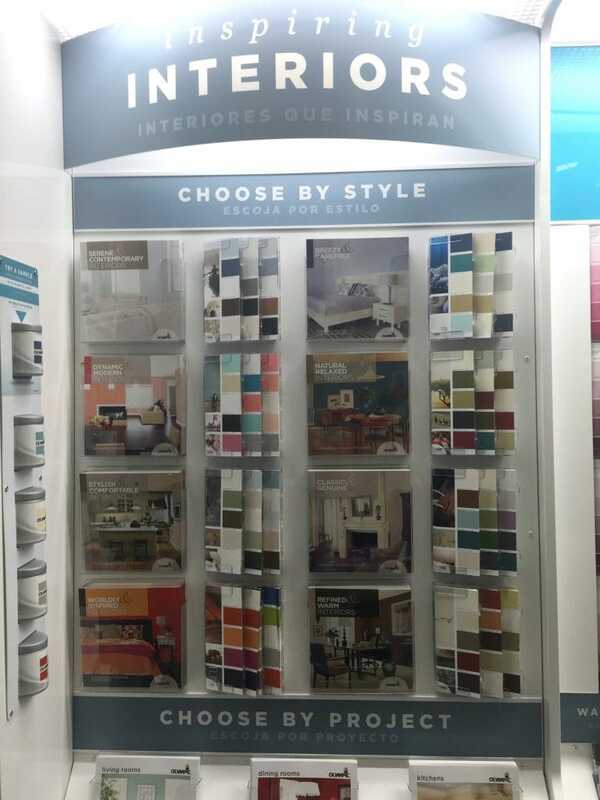 To help inspire your next project be sure to visit Olympic Paint’s Website or visit their Store Locator to find a Color Center near you. You can also follow Olympic on their social channels Facebook, Twitter, Instagram and Pinterest. This post is sponsored by Olympic Paint and The Motherhood. All opinions are 100% mine.